“We’re all about being disruptive,” said Vizio product manager Carlos Angulo at the manufacturer’s 2018 product introductions in New York this week. And clearly, Vizio is on its game again with new 4K smart TV lines boasting higher specs at razor-sharp (i.e., low) profit margins. 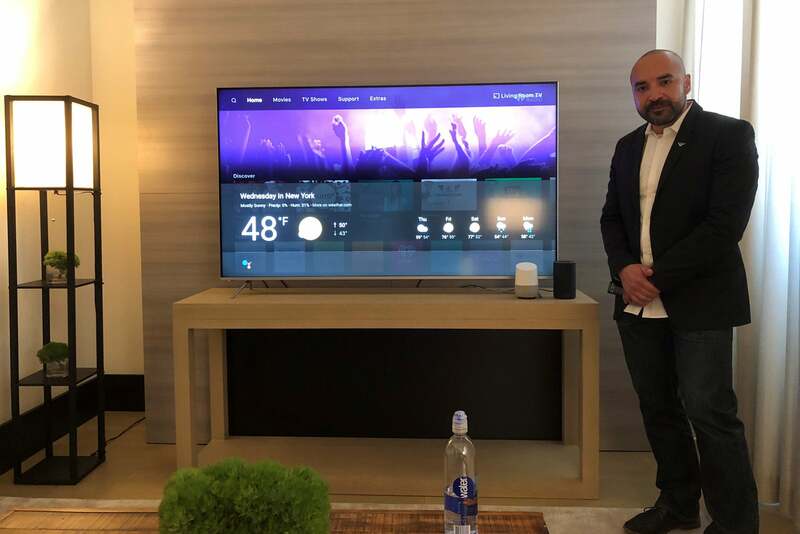 Vizio's Carlos Angulo demonstrated using a Google Home to call up a weather forecast on a 2018 Vizio P-series smart TV. At the same time, Vizio is courting the cable-cutting audience like it hasn’t done for three years, first by restoring the ATSC (broadcast TV) tuner that had been missing from most models in the lineup “and the reason we’ve called recent sets ‘Home Theater Displays,’ not ‘TVs,’” Angulo said. 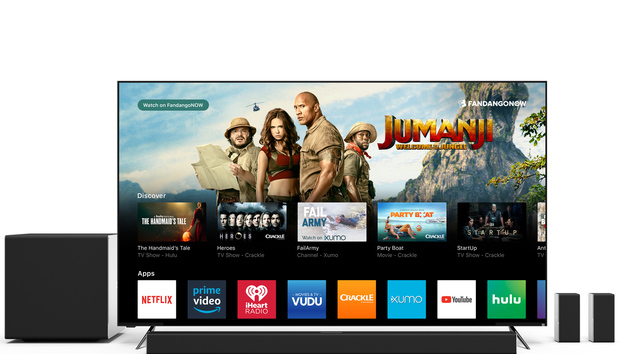 Vizio is also is upgrading viewer alternatives through its SmartCast OS platform, which is integrated with Google Chromecast and newly responsive to voice commands from Amazon Alexa and Google Assistant devices. Used interchangeably, both voice-control platforms can handle basic Vizio TV control functions, while the search-engine fueled Google system is also ready to pull up an on-screen weather forecast overlay or search for shows by name and outlet. So if you can find a sought-for film for free on Netflix, you won’t make the mistake of renting it for $3.99 from Amazon Prime Video or Vudu. Set owners can also run the operations quite nicely on a companion iOS or Android based SmartCast app, or steer things more conventionally with the set’s touchpad-equipped remote control (Vizio has given up on packaging a tablet-like remote with its TVs). The flagship P-Series Quantum resides at the tip top of Vizio’s TV game, a 65-inch model fitted with a quantum-dot display and putting out 2,000 nits of peak brightness wherever required (those Dolby Vision content encoders work it the hardest) in any of these sets’ finite 192 local-dimming zones. Vizio argues that this set’s black levels are “comparable” with OLED displays. And in a short, side-by-side shoot-out with an LG OLED, I’d say that seemed true about 85 percent of the time. The Vizio flagship’s wide color gamut also proved in fighting form. “We’re hitting 98 percent of the DCI P3 digital-cinema standard, 80 percent of the Rec. 2020 standard,” said Vizio senior director of product management John Hwang. “And at a price that makes us highly competitive: $2,195 versus almost $4,000 for a comparably sized OLED [from LG or Sony], or a top QLED set [from Samsung].” Hwang is comparing manufacturer-suggested retail prices here, which are not always reflective of street prices. 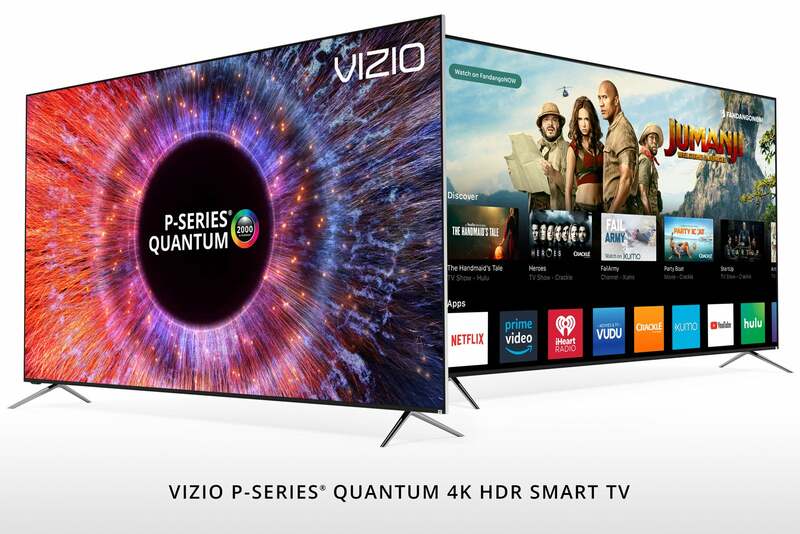 Vizio intends for its P-Series Quantum TV to challenge OLED TVs from the likes of LG and Sony. Full-array backlighting, replacing cheaper and poorer performing edge-lit technology, is also on tap throughout Vizio’s new E-, M- and P-series 4K smart TVs. Helping the transformation? “We’ve got more experience in full array backlighting than anyone else,” said Hwang. And the cost of LEDs has come way down. He said the illuminators used to fetch “well in excess” of a buck a piece, now are a “10- to 20-cent” item. Local dimming starts with the mass-marketed (through big-box stores) E series, offering 16 zones of backlighting and peak brightness of 400 nits—up from last year's E series’ 300-nit spec. Models are sized 43- ($349), 50- ($439), 55- ($499), 65- ($799), 70- ($1,049) and 75 inches ($1,549). The new M-series ups the ante to 48 local dimming zones (M models had 32 zones last year) and peak brightness of 600 nits in screen sizes of 55- ($699), 65- ($999) and 70 inches ($1,499.) Color gamut is at the Rec. 709 level. Videophiles will be more attracted to the P-series, which fine-tunes performance with 120 smaller and separately controllable zones of LED backlights. To really crank up that light saber or blazing sun, P-series sets can deliver an eye-popping 1,000 nits of peak brightness in selected spots (450 nits of full-screen brightness), achieve 94 percent of the vaunted DCI-P3 color gamut, and sharpen the impression of fast panning action with a “240Hz effective refresh rate.” That’s achieved by backlight scanning/flashing to double each transmitted image. MSRP pricing here ranges from $899 for a 55-inch to $1,299 for a 65-inch and $2,499 for the 75-inch model. Vizio is also rolling out its first soundbars capable of decoding Dolby Atmos soundtracks.That’s the immersive cinematic sound coding format that throws audio effects at you from every angle, including from above. Vizio's new top-of-the-line soundbar is a 46-inch model that supports Dolby Atmos. The flagship model measures 46 inches wide and is a 5.1.4-channel configuration, where the “.4” indicates it’s outfitted with four up-firing speakers. Two of these are inside the soundbar, along with left, right, and center channels, and the other two fire up from the petite rear satellite speakers which are hardwired to a powered wireless subwoofer. 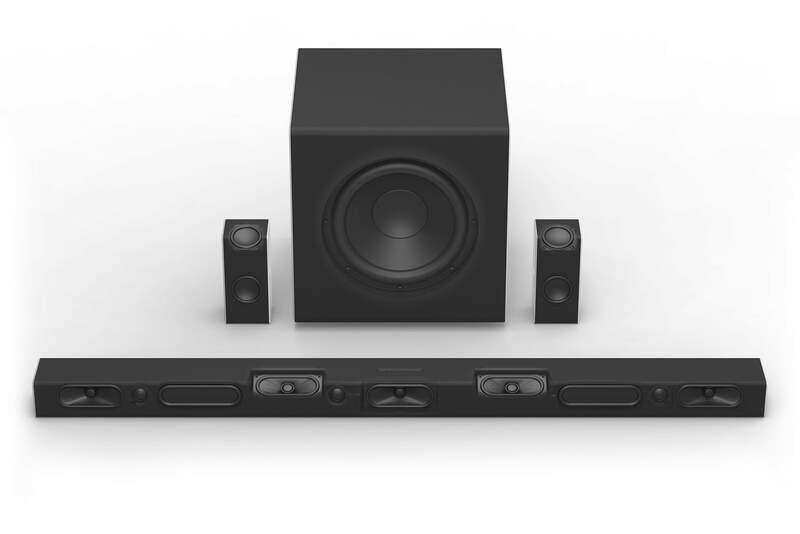 “It’s a true Atmos system,” said Vizio senior audio product manager Ryan Tubman. “We haven’t shortchanged on the multi-channel processing and amplification, [un]like some rivals.” A pre-production prototype performed impressively with a rain forest-themed Dolby Atmos demo clip. The company also has a 46-inch 3.1.2-channel Dolby Atmos soundbar and a 36-inch 2.1-channel model with dual subwoofers on tap. The smaller speaker will support Dolby Audio and DTS Virtual:X. All three systems sport voice control via Google Assistant, plus built-in Google Chromecast and Bluetooth. Vizio did not announce prices for its soundbar lineup.